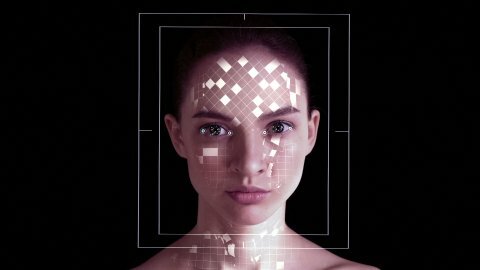 Futuristic and technological 3D scanning of the face of a beautiful woman for facial recognition and scanned 3D polygonal mesh. Personal safety. The concept of: future, security, scanning. Front View. Dry Skin. Girl with dry skin on the face and neck turns into a beautiful woman. The Iconic Self-Portrait of Vincent Van Gogh in Motion. The Iconic Photo of Albert Einstein in Motion. Internal head anatomy. Woman's head and shoulders with semi-transparent skin.